Are you wondering how all that hard work you did to implement ITIL® applies to a new cloud computing environment? And the role service management plays in cloud computing? Although many traditional IT service management disciplines remain sound practices, a cloud-based service delivery model emphasizes essential competencies in new ways. Cloud services may originate from a variety of sources; therefore the CIO must transparently integrate and manage these services to continue to deliver value -- through robust integrated service management capabilities. 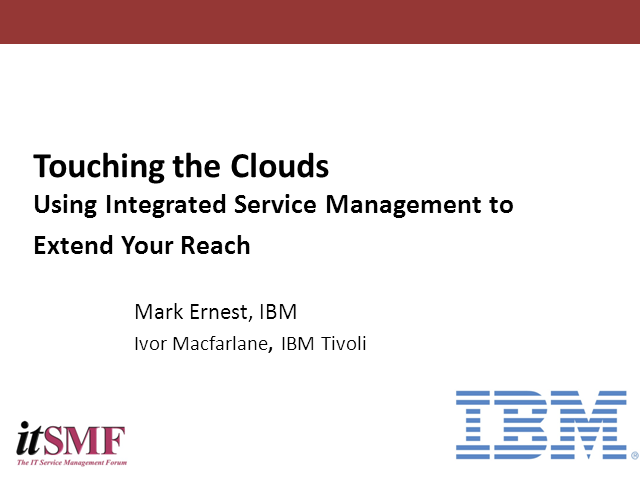 This session defines key aspects of integrated service management and cloud computing and examines the symbiotic relationship and benefits of integrating them.